The rental agreement is one of the most important legal documents that need to be signed by both the landlord and the tenant. It is a legal document that lays down the rules and regulations regarding the relationship and interaction between a tenant and a landlord in California. You should keep in mind that to be legal the rental agreement must follow all the California State Laws in order to be considered effective. Moreover, it must also include all the basic tenancy terms too. The following are the key terms and clauses that must be included in a rental agreement. The rental agreement must have the names of all the adult tenants living in the rental unit. For instance, for a family of two, the names of both the husband and wife should be on the tenancy agreement. All the persons named on this agreement should also sign this document too to make it official in California. The occupancy limit describes the number of people that are allowed to live in your rental unit. This limit should be clearly defined in the rental agreement so that the tenant cannot bring in any roommate without asking your permission first. A California rental agreement must also define the period or term of tenancy as well. You can either decide to renew the rental agreement after every month or sign a lease instead which would last for up to a year. The amount of rent that is to be paid by the tenant each month should be clearly stated within the rental agreement in California also. Aside from the amount, details like the due date of rent, acceptable payment methods and grace period for payment of rent must also be mentioned in this agreement as well as late rent fees. Security deposit is another term that must be included in a clause of the rental agreement. This is the amount that the tenant deposits when renting a property and is paid back to him when he vacates it. Make sure that the rental agreement has clear guidelines on how this security deposit is going to be used and returned back to the tenant provided the terms of the rental agreement are kept. Instructions regarding the maintenance and repairs of the rental property should be a part of the rental agreement as well. The agreement should clearly define who is responsible for repairing the damage to the rental unit and who will have to take up the task of maintaining the property. Whether you allow tenants to have pets or not, clearly stipulate in the rental agreement your terms regarding allowing pets. If you allow tenants to have pets, you need to define when the animals become a nuisance for other tenants who are paying rent and must have their right to quite enjoyment honored for the rental agreement to be fulfilled all parties. For example, barking dogs must be controlled by their owners so they do not disturb other tenants. 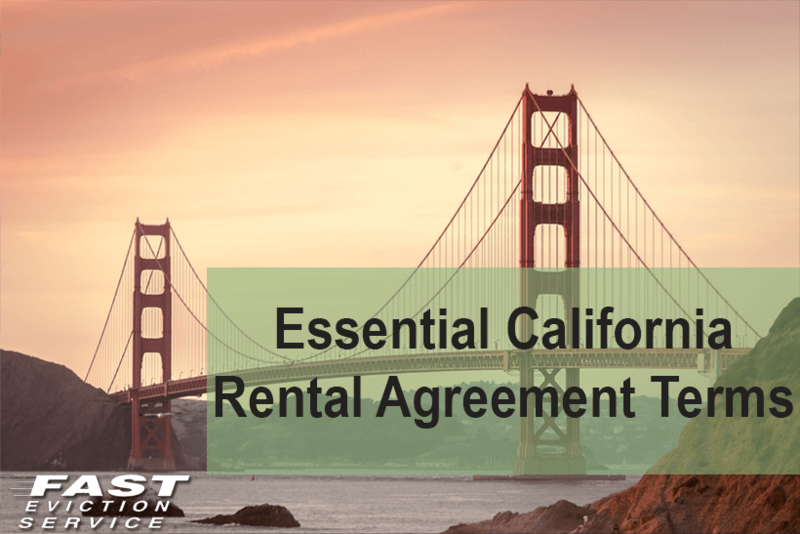 Including these essential California rental agreement terms in writing with every tenant on your property is key for landlords to prevent future problems, lost rent or incurring expensive damages.